Talk about job perks. 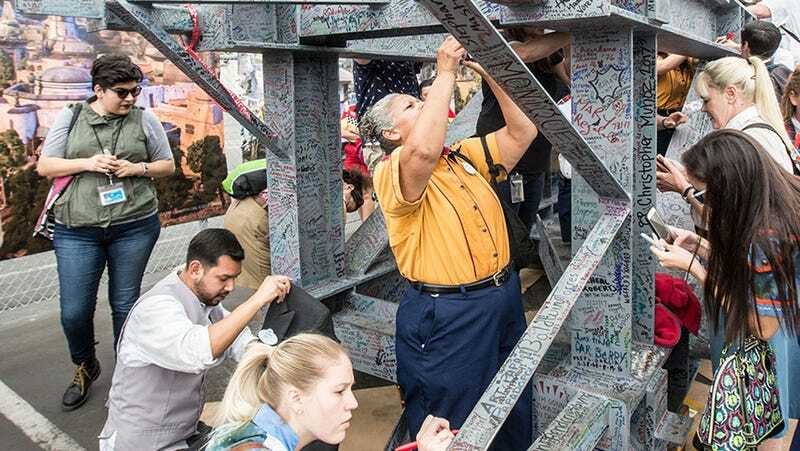 Disneyland is in the middle of building Star Wars: Galaxy’s Edge, and to celebrate the construction of the area’s tallest peak, all Disney cast members got a chance to autograph the steel beams. Meaning they get to tell their grandkids they’re forever cemented in Star Wars canon, and I’m just here... drinking my blue milk... getting super jealous. It’s actually kind of cool to see what the cast members added as their trademarks on the beam, which topped a 130-foot sculpture. You’ve got a Darth Goofy and a Yoda, and one guy signing his name as “Joe-B-Won Kenobi.” My personal favorite has to be the person who dared to write “Star Wars Who?” You’ve got some balls, my friend. The Mouse will not be thrilled. Star Wars: Galaxy’s Edge opens sometime in 2019. And if you see me in the park, keys in hand scratching “Bethwalker” in some rocks, please don’t call security.